The Documentary Project - Volume 4: "Joan Rivers: A Piece of Work"
Whatever your opinion of her may be, you cannot deny the universal fame of Joan Rivers. One of, if not the, most recognizable female comedian the world has to offer, Rivers had been thrusting herself into the spotlight for the better part of the 50 years. And whether a rabid fan, an adamant hater, or somewhere in between, everyone knows Joan. Her sharp wit and wickedly crass material have been overshadowed by her commitment to plastic surgery and unfortunate career choices but at the same time, you have to credit her for still having a career at all this far into the game. 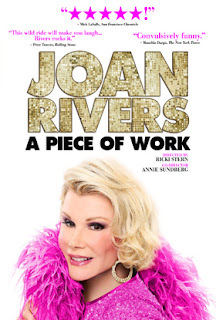 On the verge of turning 75, "Piece of Work" details the life and times of Rivers from the highs to the lows and her rise to budding superstar and fall to Indian casino bookings. First of all it should be noted that I really wasn't interested in this movie. Obviously I love a good documentary but the thought of sitting through an hour and a half of Joan Rivers sounded only slightly less ominous than wearing Lady Gaga's famed meat suit into shark infested waters. My introduction to Joan Rivers came as a child when she appeared as an over-the-top makeup saleswoman in "The Muppets Take Manhattan," an appearance that left me shell-shocked for the last 25 years. That was enough for me. But when this doc popped up on my bi-weekly search for anything new worth watching on Netflix Instant, I figured it wouldn't hurt to add it to the queue even if I never watched it. (Note to movie studios: this is not the first time this has happened. Netflix Instant is a serious boon to your industry. Embrace it.) And then the weather and AT&T became allies and launched a dual-front attack against my house a couple of weeks ago, knocking out my cable while simultaneously making it impossible for me to leave my house. So when the Lady of the Box Office refused to be party to any of the movies I suggested (who doesn't want to have a "Star Wars" marathon on a snow day?! ), we turned to "Piece of Work." Secondly, I was completely taken aback by how compelling I found this documentary to be. It provides not only a look at a comedian's creative process but also an insight into crippling insecurity. The preparation that this woman puts into her craft (comedy) and the seriousness with which she approaches it are remarkable. A wall full of card catalogues house a record of every joke Rivers has ever told and I found her editing methods to be fascinating. At the same time, the need for approval, for fame, for love (essentially) is the overwhelming message of the film. In many ways, Rivers has carved out for herself a remarkable legacy and yet all she can focus on are the rejections and the fragile state of her acting career. It's heart breaking, really, to listen to Rivers as she delves into the depths of her lack of overall confidence, something you'd never pick up for her act. "Piece of Work" also displays a strong if understated caring side to Rivers, particularly in scenes describing her kindness toward past and present employees and the continual badgering of her daughter, Melissa, concerning her smoking. Of course, being the rough-around-the-edges person that she is, her concern comes across as condescending but for me, that made these moments all the more genuine. "Piece of Work" allows the audience to view Joan Rivers as a human when most in my generation have only known her as a caricature-like presence. That humanism is where the movie makes its mark, really, and what sets it apart from other celebrity bio-docs I've seen in the past.